The Noguchi Table is an iconic sculptural table made up of two organically shaped interlocking solid wood supports holding a glass tabletop. Designed by sculptor Isamu Noguchi in 1948 as an exercise in expressing simplicity, the Noguchi Table has a height of 15.75” | 40 cm, length of 50” | 127 cm, and width of 36” | 91.4 cm. The glass tabletop surface is .75” | 1.9 cm thick and is paired with a range of solid wood bases that include Noguchi black, walnut, cherry, or white ash. 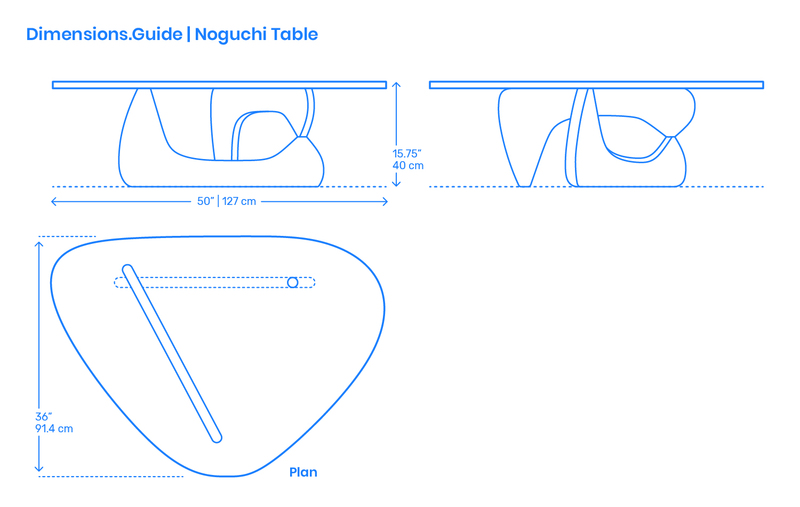 What is the Noguchi Table? The Noguchi Table is an iconic sculptural table made up of two organically shaped interlocking solid wood supports holding a glass tabletop designed by Isamu Noguchi (1948). How big is the Noguchi Table? The Noguchi Table has an organic tabletop with a length of 50” | 127 cm, width of 36” | 91.4 cm, and an overall surface area of 9.2 ft2 | .9 m2. What height of sofa should be paired with the Noguchi Table? The Noguchi Table has a tabletop height of 15.75” | 40 cm and should be paired with sofas with seat heights between 15.75”-17.75” | 40-45 cm.